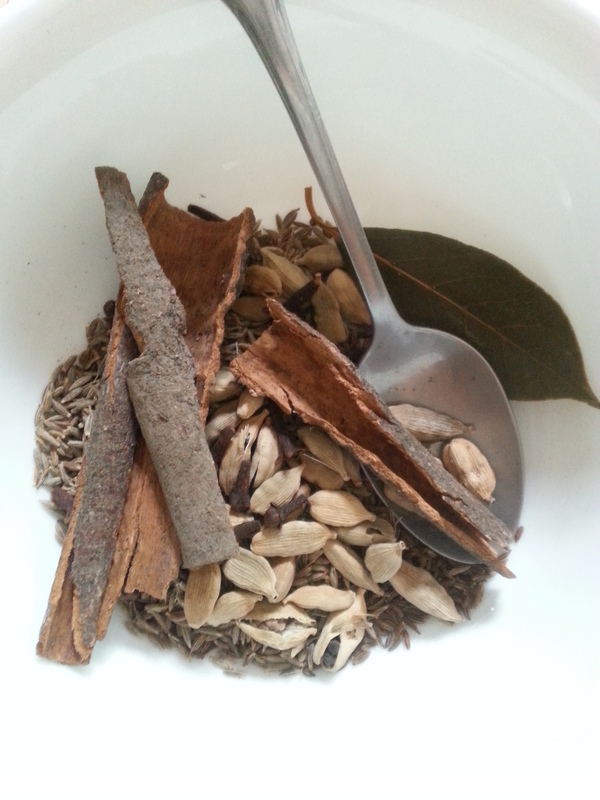 Spice mix for the Hyderabad style Biryani I made last week for a party and chutney sampling! This week Mandy and I had an epiphany of sorts. We’re doing it all wrong! Well, some of “it” at least. Through a few lucky clicks on the interwebs, leading to a couple of tropical permaculture groups and sites, and then a few agroforestry sites, came the realization that we’ve been ignoring many tropical (even native) species that are growing prolifically all around us, while slaving away at maintaining a traditional western-style vegetable garden – most of the inhabitants of which are miserable in the heat and thereby susceptible to all manner of bugs and blights. We’ve come to the conclusion that while northern salad greens, tomatoes, bell peppers, etc are really nice to have, in order to create a more sustainable, higher yield, far more natural system, we need to be working with the native plants and natural climate, rather than constantly racing against them. 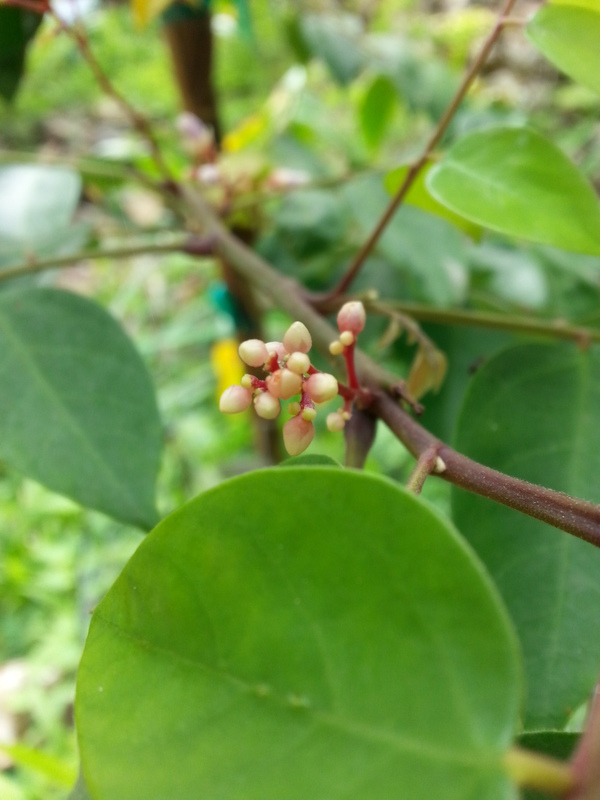 Flower buds on Mandy’s little Carambola tree. Our goals are to produce as high a proportion of the food consumed by our household(s) as possible, preferably with additional marketable produce, and sufficient fodder to raise a few meat animals and maintain a small flock of laying hens. For the household, that goal includes daily greens (preferably varied), fruit, and herbs, some amount of starches (breadfruit, plantains, sweet potatoes, yams), spices including hot peppers, seasonal veggies such as okra and beans, and some pulses/seeds. 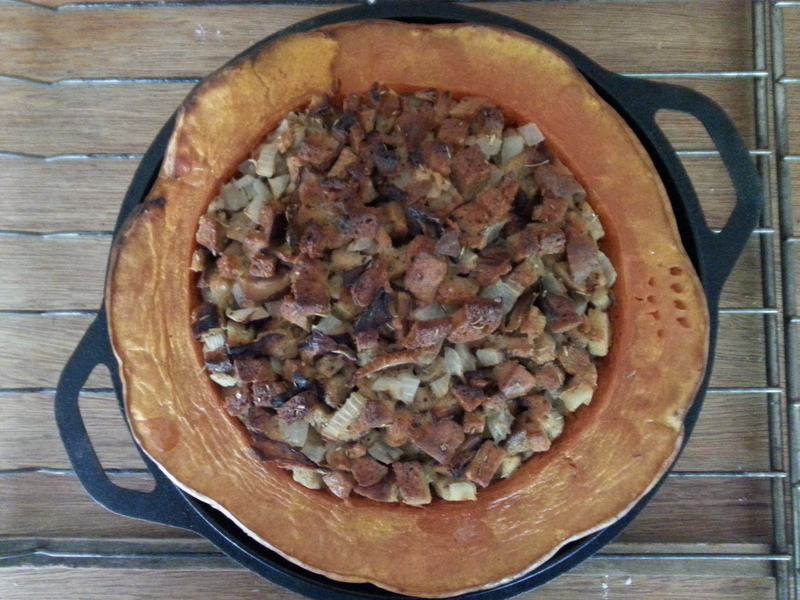 Stuffed pumpkin roasted in the barrel oven. The pumpkin was bartered for bread, with Ridge to Reef Farm, and the stuffing was made with left over sourdough bread and our own eggs. Keeping it local! Due to space and labour considerations, multi-use plants are key. For example, we just discovered that the Caribbean “pidgin pea” not only has prolific edible (if bland) peas that can be eaten green or dried, but also can be used as fodder, mulch, live-trellises (for tomatoes etc), and partial shade for smaller plants. Plus they are nitrogen-fixing legumes! If we get tired of eating the pidgin peas, apparently chickens love them, so we’re all set! So far I’d only planted a couple of these bushes, which are now some 3′ high, but I see many more in our future. Another great plant, that we’ve had for years but never before tried eating, is the common red hibiscus. Now it’s commonly known that the bright red flowers can be used to make tea, and we’ve been feeding the flowers and leaves to our tortoises for a long time, but who knew they were edible to humans? It turns out that the leaves are not only edible, but rather nutritious and make a great spinach substitute with no bitter taste, though they require a few extra minutes of cooking time to make them tender – possibly the fault of our recent drought. These most prolific bushes grow huge here unless trimmed regularly, are green year-round, and require almost no effort to grow and maintain, started from short stem cuttings set in the ground and watered once in a while. Sure, I don’t wish to eat hibiscus every day of the year, but when I sauteed them the other night with a drop of coconut oil (which we hope to soon be making ourselves), and a dab of ginger-garlic paste, they were quite a hit! I’d been searching high and low for an edible, non-invasive, low to the ground ground-cover and/or living mulch to keep down the weeds, provide fodder, and keep moisture in the ground during dry spells. Again, it turned out that I had already been growing just the thing, albeit in a tiny quantity. Sweet potatoes are apparently the answer to everything. Known for their nutritious tubers, the leaves are also edible, and are quite delicious both raw and cooked. The plants spread by sending out “runners”, which can be harvested as greens, or allowed to spread and choke out all the (inedible) weeds! The sweet potato vine also aids in moisture retention by forming a dense ground-cover – what more could we ask for? Prickly pear cactus. Commonly eaten in the South-West, but not so much around here. 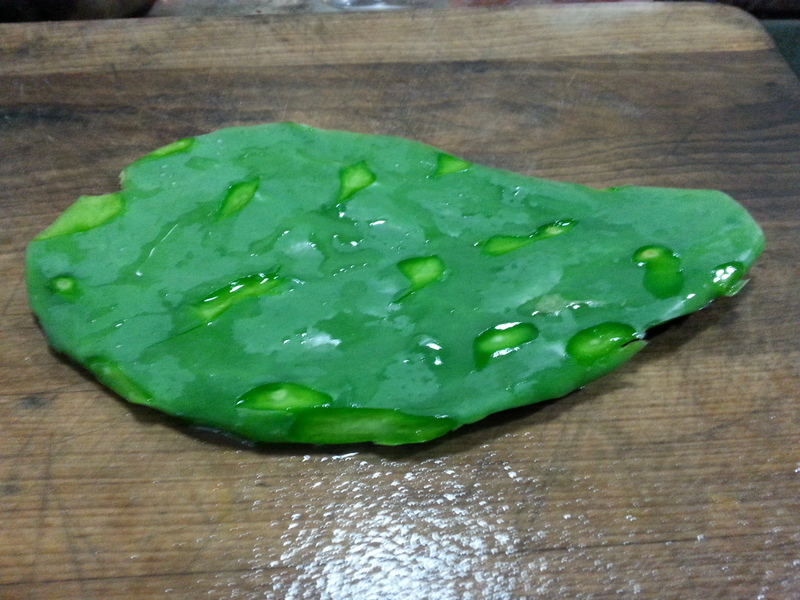 Lastly, I finally got around to experimenting with the prickly pear cactus – not the fruit, but rather the cactus pads. They are prickly. The almost-invisible needle-like hairs growing in little clusters over every surface of the pad feel almost like fibreglass when embedded in your skin. Once you (very carefully) get past the prickles – or rather, remove them with a sharp knife, one cluster at a time – you’re left with a firm green pad, about 8″ long and 5″ wide, which is oozing a mucilaginous clear juice from each cut. Now that juice is a pain! It’s stringy and gummy and sticky. It gets on everything, and while it does wash off, I’d swear that it jumps from surface to surface on its own! This only gets worse when you start slicing the pad into 1/4″ slices, when more and more slime leaks out. Have I put you off yet? Hang in there, I did. First I tried roasting a few slices over an open flame, as I might do with a bell pepper. 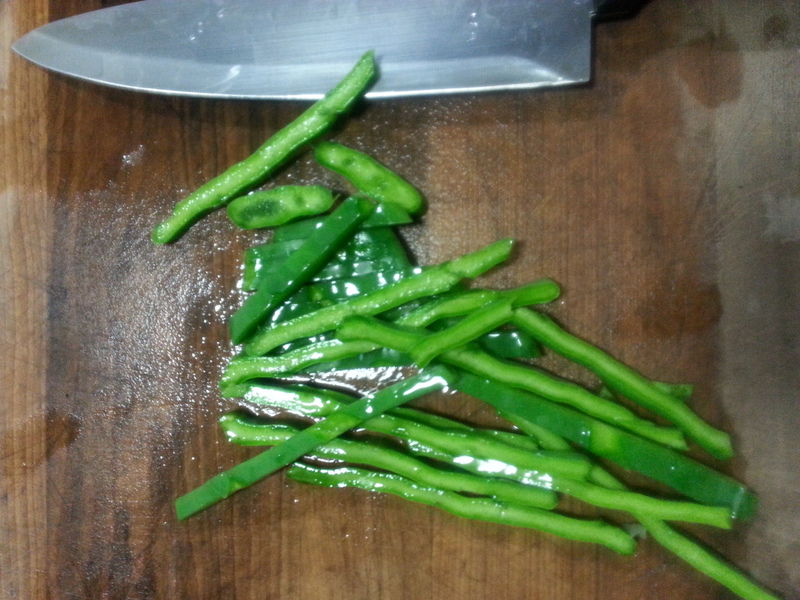 Strangely, it came out tasting just like a grilled pepper, with a very similar texture if still a little slimy. Fine, but boring. 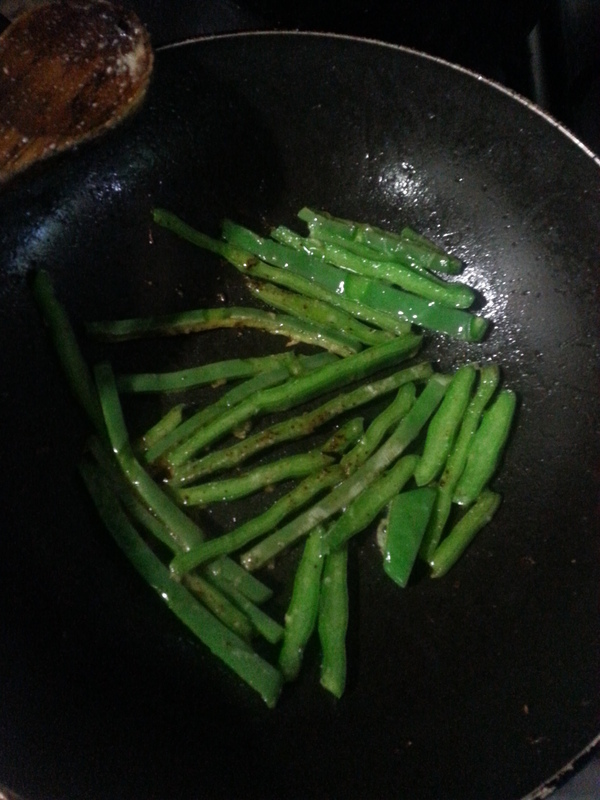 So, I heated a skillet, added a dash of coconut oil, the remaining sliced cactus, salt, and a sprinkle of chilli powder…five minutes later…wow! The oil dealt with the stickiness perfectly, and the chilli was a wonderful flavour accompaniment to the mild, fresh flavour of the cactus. As well as it being an exciting week mentally in regard to the agriculture side of our existence, it’s been an exciting week on the Nid! 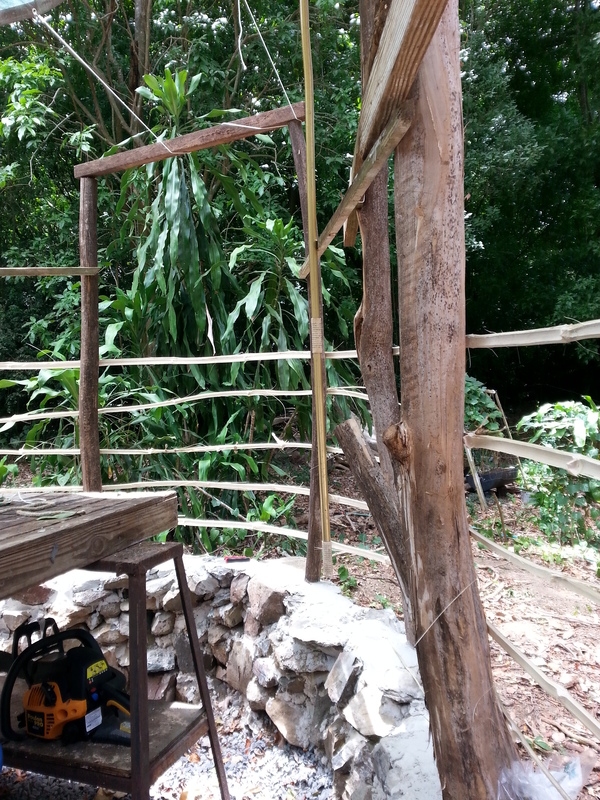 I finally reached the stage of splitting bamboo and attaching lathes to the outside of the posts, thereby forming the basis for the thin-shell cement walls. 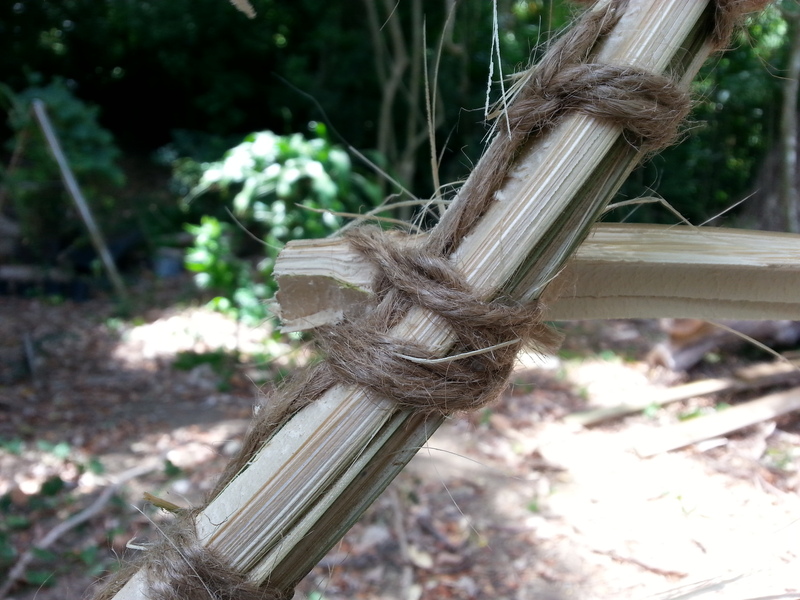 Splitting the bamboo continues to be a learning process, as every stalk splits differently – some split easily into just the right thickness, others I fight with, my most trusted weapons being a hatchet and hammer. Once I have the lathes ready to go up, it’s a matter of screwing them in place on each post, making sure that each part of the curved wall has the right amount of bulge or dip. 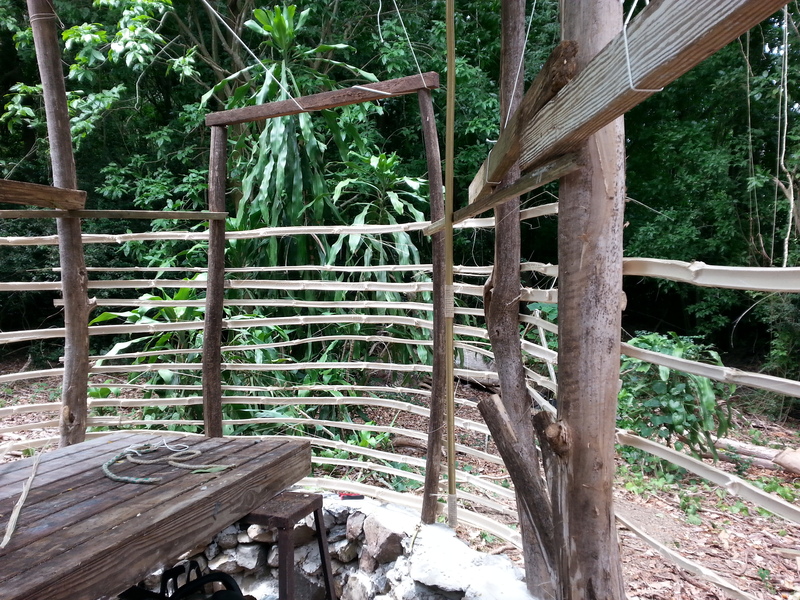 I know that the walls will be very uneven due to the curved and lumpy nature of the posts, but I must be sure the even those discrepancies out as much as possible so as to not end up with huge hollows or voids that might allow water to sit, or be impossible to plaster. So far it’s going very well, even the first window opening! 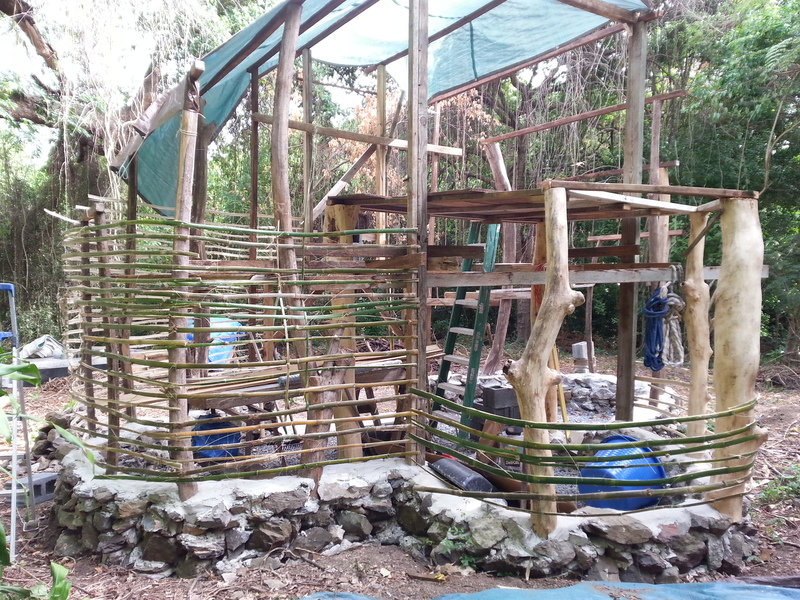 Tomorrow I’ll be harvesting more bamboo, and I hope to be done with the bamboo of the walls and roof within a couple of weeks. 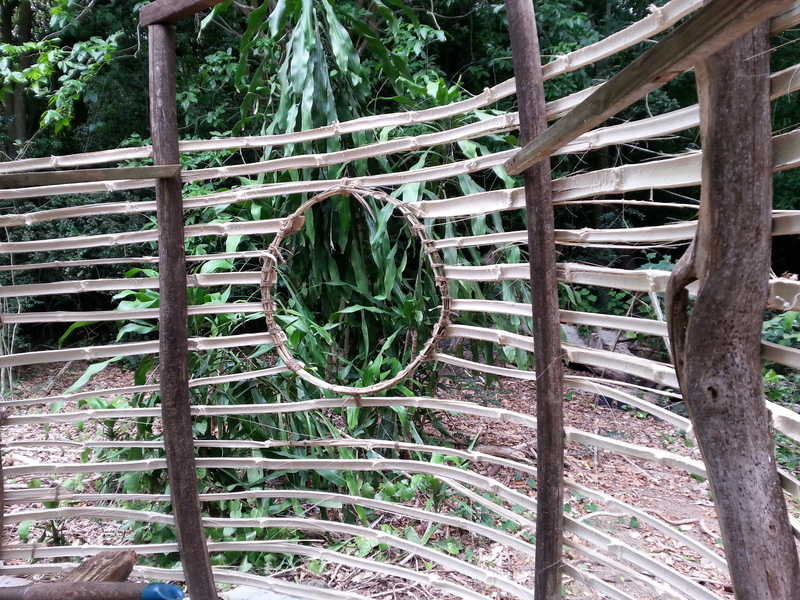 Detail of lashing on a window opening. Lathes up to the lowest rafter height in the kitchen! And starting on the bathroom. In case I wasn’t busy enough this week, I also started building a second chicken tractor (mobile coop), as I’ve decided that I should get another half dozen laying hens. This will mean having a decent volume of eggs to feed ourselves, our guests, and to sell or barter locally. I’m also using the chickens as weed control, so far they seem rather more effective than weed whacking! 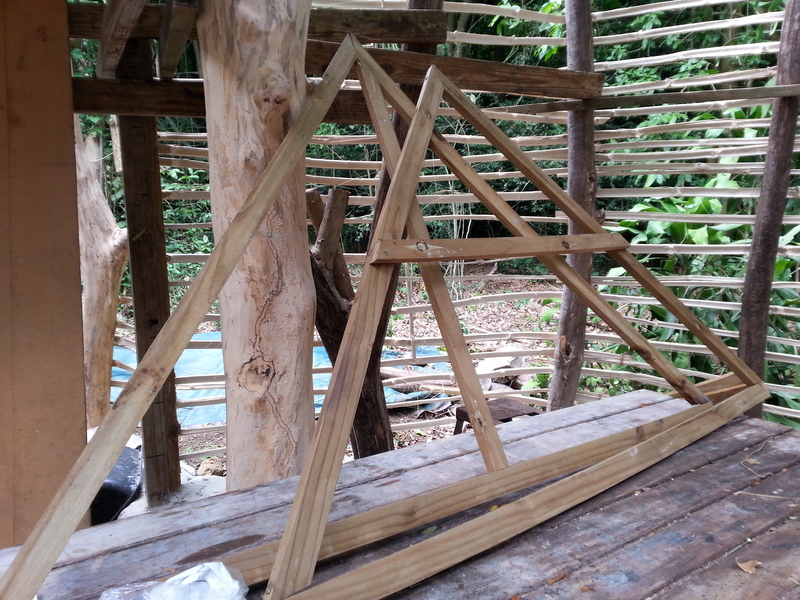 Making A-frames for the new chicken coop. Now that’s enough – til next week, cheers! Such a nice note to recieve first thing on a Monday morning! The design of the Nid is pretty original – I stumbled across one sketch for a similar structure of a smaller size, never built, and ran with it changing almost everything as I went! It’s a very unique structure, and will hopefully stand up to the test of time…and hurricanes. Enjoy your summer with the grandchild!